In TUNA BREATH, Doug writes about how low self-esteem and negative emotional response dictated his life for over a decade. When he finally decided to lose the weight, he took it too far on a diet of only canned tuna fish and oranges. While he was happy being thin, he wasn’t satisfied with being a one-hundred-and-fifty-pound-weakling. His sensitivity from being obese as a kid forced him to pursue competitive ambitions to prove his self-worth. Never satisfied with the results, he traded in the current accomplishment for the next imagined bigger and better goal. He joined the Marine Corp., became an Investment Banker on Wall Street, and then a successful technology salesman. The constant shuffle satisfied the immediate need for success and competition, but left Doug without any meaningful relationships. He was selfish, lonely and heading down a destructive path towards alcoholism. When he was a child he masked his emotional truth with food, now as an adult, Doug was hiding behind the pursuit of success and alcohol. 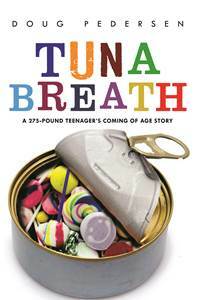 TUNA BREATH is the story of how Doug Pedersen wrestled with his extreme sensitivity and obsessive behavior and developed a long-term perspective that brought balance and order to an emotional life that was out of control. Don’t forget to sign up for the email newsletter and stay up-to-date on speaking engagements, the book release, and other powerful information you can use to positively impact your life!